Summertime afternoons around here are too hot for anything but reading and swimming. And even the swimming is iffy because of sunburns. So we tend to have restful afternoons reading and resting. I give the kids a pile of good books, and they pick the one they want to read next. Right now, Eowyn is on her third book and Gideon on his second. He's reading about Captain John Smith as a boy and loving it. I have finished his plans now for next year, except for the literature section and the Shakespeare section. I'll add the literature plans in after I see which books he gets finished this summer. (We only have a month and a half left now.) And I'm not sure how I'm going to do his Shakespeare studies. At our co-op, the kids memorize some lines and we read a translation of the play in our Morning Meeting. And that might be enough for Gideon. 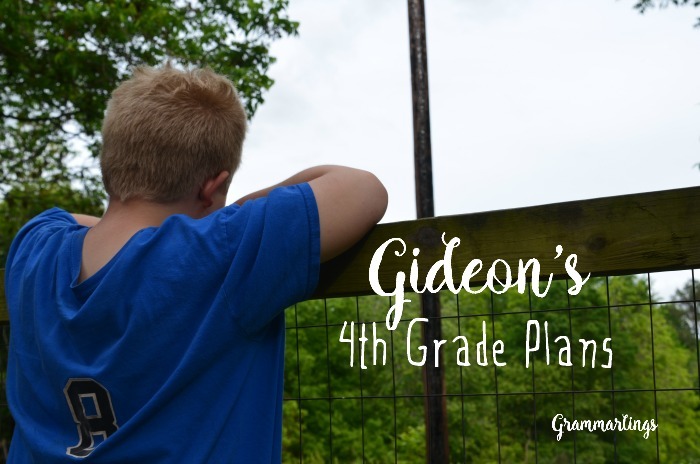 As I said in Esmond's plans, Gideon and Esmond have some shared books (like the Burgess Book of Animals ) and Gideon is still pretty young at heart and loves to listen to storybooks so I'm sure he'll squeeze in with us many times. But he's also sharing some things with Eowyn, like Art and Poetry studies (found at Ambleside Online). He'll do some math practicing with Khan Academy (free math lessons, and more, if you haven't heard of it), Spanish practice with Duolingo (free language lessons), Latin and Greek (on a slower schedule than Eowyn), and Writing & Rhetoric books 3 and 4. 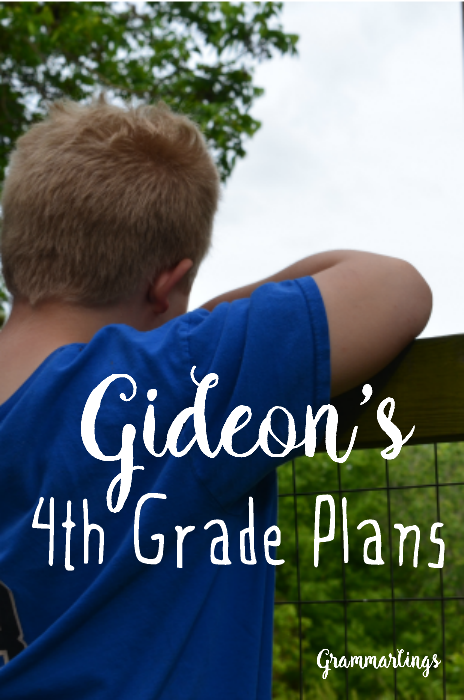 So here's how I'm planning to break all that down to manageable, weekly bites: Gideon's 4th Grade Plans. If you'd like to check them, feel free!